Want to know how I print free? Are you spending too much money on ink like I was? Are you sick of buying ink and limiting the amount you print because you’re afraid to run out? Or maybe you don’t print that often and you don’t want to spend money on ink that you will only need once in awhile. Whichever applies to you, I found the perfect solution! I’m going to share with you how I get totally FREE printer ink shipped to my home for free! Yes, seriously it’s free! FREE INK! No more shaking those ink cartridges or forgetting to buy ink. So what’s this solution? The HP Instant Ink Program! HP Instant Ink is a program developed by HP that takes care of all of your printer needs on a budget! With the Instant Ink Program, your HP qualified printer will automatically send a signal to HP to tell them you need ink, and it will be delivered to your home for free before you run out. How cool is that? Have you checked out THE FREEBIE LIBRARY? 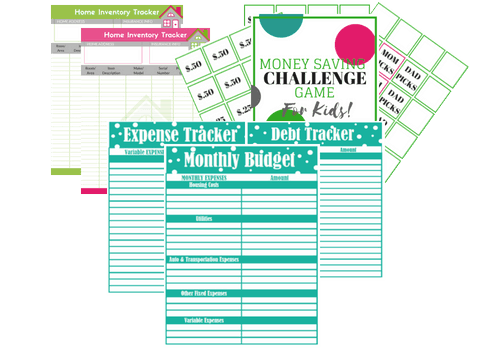 Filled with lots of Free Printables, eBooks, and more! Get access here. Plus they will provide postage-paid shipping materials to return used cartridges; I love that since it was a pain to recycle my old ones. Ok so this may sound too good to be true and you may be thinking is there a catch? Well, you do need to have an eligible HP printer (more on this later) and have it hooked up to your wifi network but that’s it. If you don’t currently have an HP Eligible printer than you will see why it may be worth it to run out and buy one (I got mine for under $60). Depending on how much you print there are plans that can fit your needs starting for FREE! 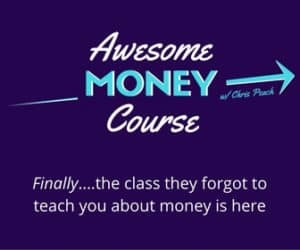 If you need to enroll in a paid plan because you print a lot don’t worry because I am going to show you how you can easily get a bunch of free months on ANY plan so that you can possibly print free for life! I’ve been with the HP Instant Ink Program for a couple years and have not had to pay a monthly fee yet so keep reading! You may also like: How to Listen to Audiobooks for Free! Most HP Printers are now Hp Instant Ink Eligible and that means you can get ink delivered free to your home before you run out and on autopilot! Like I mentioned above, the HP Instant Ink Program offers a FREE Ink Plan that allows you to print 15 pages a month at no cost to you. I love that they offer this for those of us who hardly print and may just need to print a few things a month. With the free plan, if you print less than 15 pages a month you now already have free ink for life! Simple right? Ok so what if you print more than 15 pages per month? Don’t worry I will show you how I was able to get free ink for years and I can print up to 300 pages per month. Plus I get rollover pages so I never go over my page limit. Once you see how easy it is to get free ink than you’re going to want to run out and buy an HP printer asap and they are very inexpensive. I probably bought the cheapest one they had that worked for this purpose (I’ll share with you how to buy the right one and which one I have). If you already have an HP Eligible printer then you just need to sign up! Ok so here it is…. First, you have to have an HP Instant Ink Eligible Printer. Amazon has a great selection you can check here. You can easily tell in the product description of a printer whether its eligible. You can also find a list of eligible printers on the signup page. I have the HP ENVY 4500 Series All in One Printer. As you can see by the screenshot Amazon clearly displays in the titles that the printers are Instant Ink Eligible. Please note: When purchasing your printer in-store or online do not purchase the HP Instant Ink subscription with it. You will subscribe after you get home with these instructions. Pick the best plan for your needs! Remember you are not going to be charged until free months run out. Plans start as low as $2.99/month depending on how much you print. 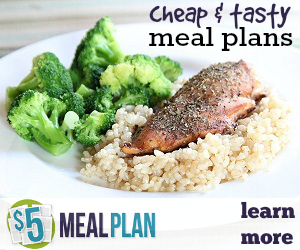 I recommend choosing one of the higher plans since you’re getting free months, you can always lower it later. You can also cancel the service at any time if you don’t like it. 3. Enter HP Instant Ink Promo Codes. MOST IMPORTANT STEP! This is the step that will allow you to be able to print for free for months no matter which plan you choose so read thoroughly. 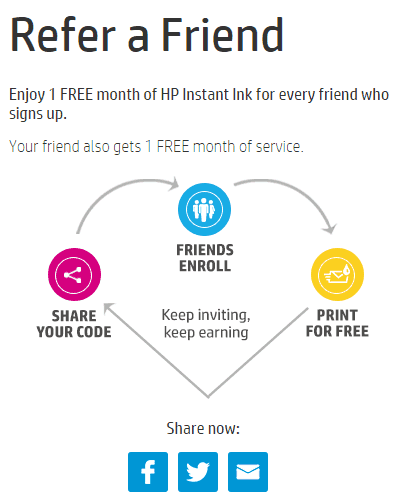 To start you will want to use a referral code to sign up which will give you 1 FREE Month of Hp Instant Ink. Use referral link and code tj7Dh or just click here and it will add the first free month. THEN you will enter HP Instant Ink promo codes to get additional free months during registration. This is where you want to get as many free months now as possible. If you just bought your printer it should have come with a promotion code in the box to use to get 3 months free when you first sign up. Make sure you go through a referral link or code FIRST to get the 1 free month I mentioned above and then use the promo code you were given to get the additional 3 months for a total of 4 months! Plus try and add the additional codes mentioned next and you can get even more free months! If you don’t have a promo code with your printer because its one you had already then you can try to stack some of the following HP Instant Ink promotion codes (codes may expire at any time so try them all). Some of the codes will combine so just make sure they are in ALL CAPS and enter one after the other. Codes change often so I will try and keep this post updated. IMPORTANT! Before you checkout, make sure you see the one month free from refer-a-friend and other months free from the promo codes you entered and that your total is $0 before submitting the order. Usually, with the combination of promo codes, you can start off with between 4 and 6 months of free ink. Leave me a comment on this article if the codes are not working for you so I can try and get a new one or if you need help. 4. Share your referral link and codes with friends and family! This will be what gets you the most free months! You have 4 to 6 months to refer a few friends to keep your free plan going. This should be easy considering the HP Instant Ink program is super affordable and very convenient even after the free plan ends. To help you I am allowing you to post your referral code in the comments of this post! So post your codes and let’s help each other save money! Send your friend your code and send them this article so that they can get the most free months as well! If you like your printer, and it doesn’t qualify for the program, but you just want to know how you can save money on ink, check out 10 Ways to Save Printer Ink. Questions? Comments? Leave them below and I will answer them. Thank you for visiting Esavingsblog, if this post helped you, please share it with your friends using the sharing buttons above and below this post. *The 3 month Hp Instant Ink coupon codes expire every few months so grab it while you can, I will update the coupon code as new ones come along. Please leave a comment if the code does not work and I will try and find a new one. Try all of the codes mentioned first. Codes do not work in 2019 except for FREEINK. I tried ALL of them and that was the only one that was recognized. Thank you. THANK YOU FOR LETTING ME KNOW! I will look for updated ones. You should get one month with my referral link and more with the FREEINK code. If you joined feel free to leave your referral link in the comments for others to use and I will be happy to share it as well so you can earn some extra free months :). Where do you type in the promo codes? I already have HP instant ink, and there’s nowhere to type in a promo code on the website? Hi Olivia, you have to do it upon signup. I am not sure you can add them once you are a customer since the codes are for new customers. BUT if you are already an HP instant ink customer go ahead and leave your referral link in the comments and when other readers use it you will get a free month. I will also share your referral link as well, hope this helps! Something to mention, when you google instant ink coupon codes you will come up with multiple “referally codes” and you can only use one. I made the mistake of putting in a code I found on retailmenot and I couldn’t get it back off. So…I wish I would have found your site before reail my not because I just earned some stranger a free month! LOL The FREEINK code did work ask well. Just putting that out there incase someone goes code happy like it did! Thanks for sharing! Feel free to share your referral link here in the comments for others :). You’re Welcome, thanks for sharing! When I was chatting with HP customer service today they said the only promotion they have right now is the $5 ecode you can use on any plan. So pretty much only 1 month free. Has anyone had any luck this month with getting any more months free? She also said they no longer have the refer a friend promotion. Is that true or can we still get that promotion just fine but they just aren’t advertising it?Thanks! Hi Jessica! As far as I know, it is still going! I get referrals all the time and I just logged into my account and see that it still shows a referral link. Was it the HP instant ink customer service? The last working code was “FREEINK” according to previous commenters but codes do expire all the time, unfortunately. You should still get the 1 month free from the referral link (you will see that before you checkout)and you can try codes or if you bought a new printer those usually come with 3 months free as well (in the past). You can try it using the exact instructions I leave here, you will see the free months before you check out so that you will know before proceeding. If you do sign up please leave your referral link here for others to use :). Hope this helps! Hi Suzanne! Thanks for checking out my blog and sharing your referral link! Hi, thank you for the chance to get a couple of free months. You get a $5 gift card for instant ink, then I could use the FREEINK, referral code (which i have no clue where you put that but I had a rep put it on for me), and got 3 months free when i set up my eprint on my printer (you set it up on your printer touch screen for mine. then it prints out a paper with the code). So I got like 5 1/2 months free basically with what i did. You can only enter 1 of each kind of code I guess. If you cant put them in you will have to talk to a rep. Here is my referral link. Thanks! 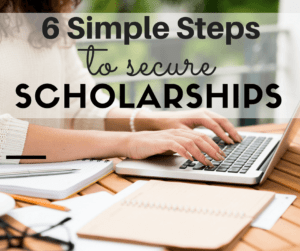 REMEMBER TO PUT WHAT YOU CAN IN BEFORE SUBMITTING WHEN YOU REGISTER. Otherwise it is a big pain. Yayy! I am glad it worked out for you! I will share your referral code as well. Thanks for coming back and sharing your experience I am grateful :). I would try one of the other codes before the FREEINK one because that is only 1 month and yo u can only put 1 of each type on there. so to all you who want a FREE MONTH OF INK, please use this PROMO CODE mztGm THANK SO MUCH!!!!! You’re welcome! I’ll add your referral link to my list to share, thanks! Hi, thanks for your blog, unfortunately FREEINK did not work for me today, however I’ve used one of the codes and have one month free, thanks again. Did you try the other codes? I will share your code and hopefully, you will get some referrals :). Thank you for this post!! When I did the installation of my printer it wouldn’t let me put any codes in, so afterwards I did a click to chat and they put in the codes and the referral code. Thank you so much! I ended up with 5 months free! I would love it if someone used my code to sign up. Free ink helps this homeschool mama out a lot! Also the click to chat rep told me that if you forget to put in a referral code you can chat with them and They can add one within 30 days of you signing up! I just found your article about printing free with HP instant ink, thanks so much. Thank you for this article and the codes. I was able to use FREEINK code and use referral code from Eric to get a total of 2 free months. Here is my referral code incase someone wants to use to get a free month of Instant Ink. Thanks this was useful information! Wow I have gotten a few emails that said my friend has signed up for instant ink, I totally thought that we would get one or two but never did I expect 5 people to do it! My son and I are so grateful for this blog, we are starting a new business (he polishes Petoskey stones and sells them on Etsy) he is saving up for a new bike. So printing is essential. I just wanted to say thank you to everyone for the help and my son Jason says to everyone he is very thankful!!! Our referral code is mztGm if anyone wants to use it they will get a free month as well! You are very welcome! I try and share the codes on the blog inside the post as well (I’ve been swapping my code out for people who leave theirs) so I am glad you were able to get more free months! Thanks for coming back and commenting, I appreciate it! Thanks for the help! FREEINK was the only one on your list that hadn’t expired. My referral code is tj7Dh for anyone who wants to use it and get us both a free month 🙂 so exciting!! Thanks for stopping by and commenting! I will share your code as well. Thank you, Kiki! I signed up so long ago I wish I had done screenshots of the process to make it a little easier. I will share your code as well and hopefully, you will get a few more referrals! Hi Heather! I will add your code to my list to share! Thanks for stopping by :). Thanks for the free month. This is awesome, really works thanks! Hi Peter, I already added your code to my list to share :). I change out the codes in the actual article for my reader’s codes so yours will be shared in a couple weeks as I have a couple ahead of you but in the meantime, anyone stopping by can use it by checking the comments as well. Thank you so much for stopping by!